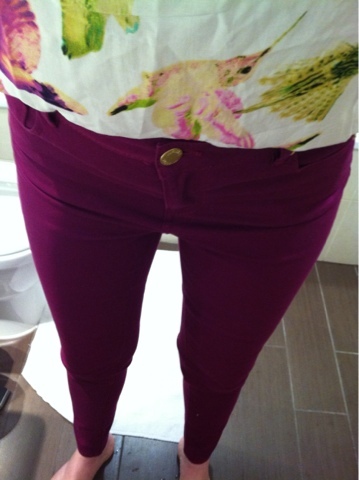 I know you have all been waiting with bated breath for an update on the coloured jeans situation. I am pleased to report that a pair have been found, bought and worn as you can see from the picture. The original Warehouse mint coloured ultra skinny ones had to go back I'm afraid; I thought about it and decided children and light coloured clothing don't mix, plus the colour washed me out. I opted for this dark pink colour instead as it also went nicely with this bird print top, alI from Warehouse. I do love the idea of jeans that are a bit different to the norm and also nice and colourful for spring. However these are not the comfort option and I was glad to take them off at the end of the day rather like a too tight pair of shoes. I did notice in London a lot of coloured jeans being worn though the main wearers did seem to be 14 year old French exchange students. Am I too old for coloured skinny jeans? What do you think? I have no idea how old you are, but I think if you want to wear coloured jeans then wear them! It's how you rock a look that counts!! True but it doesn't do much for the confidence when all the other wearers are 14! Peachy colour sounds very good and also very K-Middy (my idol). I'm down with the colour now (as they say) it's just the fit. I think I should have worn them around the house for a few hours and done some lunges/squats to check they were sustainable for long hours. oh well, no pain no gain! I'm not too old (older than you! )so therefore you aren't either, bought myself a blue pair today too! Loving the printed ones just got to find ones that aren't too loud! I change my clothes as soon as I hit the front door I'm afraid, too much bleach, kiddy food etc! We had a French aupair once, lovely lovely girl but even here lingerie was designer, I think its in their genes, no pun intended! Tried to amend my first post without success. Thanks! I saw the printed ones in Warehouse too but wondered if they might be the sort of thing that would soon go in the sale. I try and buy classics as I don't have enough money to buy too many "on trend" items. Hopefully the dark pink jeans are classics and not a fad! I think your pic looks fab so stick with them..
Aw thanks. I must say I've seen plenty of non stick thin people in the coloured jeans and I think as long as you buy the ones with plenty of elastane in them they look great. Having said that they are definitely *not* the comfort option! Yes from Warehouse! there was a 25% off day so they worked out at £30 which I thought was quite reasonable. I had a quick look at the Oasis ones in Covent Grd yesterday and I think the quality of those was slightly better. It's all about trying on loads and seeing which ones fit best, but who has the time or patience for that? !